Teton Shadows is a two bedroom + loft, two and a half bathroom townhome located inside the Grand Teton National Park. This property is truly in the shadows of the Teton mountain range and borders the Jackson Hole Golf & Tennis Club. Teton Shadows is also just a short drive from Jackson’s Town Square. This unit sits in a truly unique location given its proximity to the abundance of wilderness and alpine areas found in Jackson Hole and the national parks, allowing our visitors to step away and simultaneously enjoy the adventure and tranquility of this special region. When staying at Teton Shadows, you’re right inside Grand Teton National Park, just a few miles from where the bison roam, yet only ten minutes to the quaint, historic town of downtown Jackson. With two decks, a balcony, and a creek that seasonally runs through the property, our guests have an incomparable vantage point for taking in the outstanding views, breathing in the crisp mountain air, and simply enjoying the magnificence and beauty of the region. Any trip to the Jackson Hole area should be a memorable one. Teton Shadows only adds to the experience that is Jackson Hole, given its combination of location, convenience, and comfort. From the parking place directly in front of the unit, you’ll reach the front door by crossing the main deck. Upon entering the unit, you will see the kitchen on your left, stairs leading to the bedrooms on the right, and the living and dining areas straight ahead. The L-shaped kitchen includes an attached half bath. 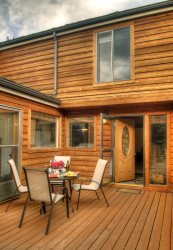 The deck can be accessed from the living room through a sliding glass door, from which our guests can view a seasonal stream trickling by. At the top of the stairs you’ll find the ladder leading to the adventure room. To your left you’ll enter the master bedroom which hosts a fireplace and the master bath. Adjacent to the master bedroom is the second bedroom and an attached, spacious bathroom. Master Bedroom - Featuring a western-styled, king-sized bed that is topped with 300-thread count sheets, a lightweight comforter and extra pillows. The master bedroom also has a fireplace, vaulted ceilings, and its own private balcony that faces the Sleeping Indian mountain. Second Bedroom - Featuring a queen-sized bed with a large attached bathroom. The room also hosts vaulted ceilings and generous floor space. The Adventure Room - This area is accessed by a ladder and is fully enclosed. We only recommended this area for children or adults who are comfortable with climbing a ladder. This room is furnished with three twin-sized beds and has abundant space for playing in its secluded setting. The ceilings in this area are slightly lower which also makes this room more suitable for children. Kitchen & Dining - The kitchen has an L-shaped floor plan, an arrangement that allows whomever may be cooking to remain part of the party. The attached half bath adds additional convenience for everyone on the main level and also houses the washer and dryer. If you plan on utilizing either the front or back decks, the kitchen provides easy access to any. Just a few steps from the kitchen is the front deck access, and just past the dining and living areas is the back deck access. Teton Shadows is located in Grand Teton National Park, adjacent to the Jackson Hole Golf & Tennis Club and just minutes from downtown Jackson Hole. This unit is in close proximity to everything people come to Jackson Hole to do and see, whether that's visiting the National Parks, playing a round of golf with the Tetons in sight, hiking in the summer, skiing in the winter, or photographing wildlife, Teton Shadows is in the middle of it all. Additionally, the services at the Jackson Hole Golf and Tennis Club are available nearby if you’d like to enjoy their fine-dining restaurant and extensive wine list after a round of golf. If you are looking for a quiet location inside Grand Teton National Park with the added amenities of a golf and tennis club, while simultaneously surrounding yourself with nature and wildlife, Teton Shadows is the place to be for your next visit to Jackson Hole. Jackson Lodging provides some essential items one may need for their stay. We place linens and terry in the unit, which are washed with Green seal-certified detergents. Toiletries (shampoo, conditioner, lotion, mouthwash, a grooming kit, toilet paper, and Kleenex), dish soap, sponges, trash bags, etc., are provided for your use at no additional charge. Kitchen amenities, other than coffee filters, are not provided. There may be items such as spices, ketchup, salt, and cooking oil at the property that have been left from previous guests. This cabin is cleaned with Green Seal-certified products for your health and the environment. Nice Place to Stay. 4 adults stayed here from May 13th thru May 16th. The townhouse is very nice in a great neighborhood. Kitchen was very well stocked with all the pots, pans and dishes we would ever need. It is near the airport and about 10 minutes from downtown Jackson. Very happy with our selection of this property. The adventure loft looked great, we just did not have anyone to use it. It would be awesome for kids. We thoroughly enjoyed our week-long stay at Teton Shadows. My wife and I thoroughly enjoyed our week-long stay at Teton Shadows, and we really appreciated the nice touches provided by Jackson Lodging Co. Since we're recent retirees traveling without kids, and didn't need to access the bedroom loft, that wasn't an issue. (I'd have no trouble climbing the stairs, but my wife would have.) Everything else about the townhouse was wonderful. We especially liked the ultra comfy master bed (even though its height makes it a slight challenge to climb onto), the conveniently organized kitchen, the PC-friendly wi-fi, the washer & dryer right off the kitchen, and the modern flat-screen TV over the fireplace. The only quirky things I can think of were the roller shades that made me feel like I was hoisting a flag up a flagpole every time I would roll them up in the morning and down at night. (Note to designer:vertical blinds are so much easier as window treatments for sliding glass doors.) Anyway, the location about 7 miles north of town is perfect. It took no more than 10 minutes to drive into Jackson for shopping & dinners, and yet it's only 20 minutes or so from Jenny Lake in the Central Tetons. So access to everything in the Park is relatively easy from this starting point. We've been renting condos & houses for vacations for more than 15 years now, and nearly always enjoy them much more than hotels. As long as you don't mind tidying up after yourself, there's really no comparison. Places like Teton Shadows win out every time. This home was as described. Loved having the washer and dryer as we were traveling. Convenient to the things we had intended to see. Nicely furnished and equipped. We all enjoyed the quiet location and its surroundings. Would return if we were to be back in the area. We could not have found a more cozy cabin for our ski trip to Jackson! Thanks for all the fresh snow! We really appreciate your being willing to share this special spot with us. No detail was omitted in the interior decor and the views are terrific. Full kitchen, washer/dryer ~ just like home! As we prepare to leave, we are planning when we might return. First laid eyes on Jackson in 1960 - so many changes since then, but still one of the most inspiring places in the country. Thank you! Amazing view, gorgeous neighborhood, beautiful home, clean, cozy....just like home! To start with Jackson Lodging Co. was fantastic; very knowledgable, helpful and accommodating always taking into concern our comfort and satisfaction. Less than 10 min. from the airport, away from city and traffic, a breathtaking welcome was the drive to the home. The neighborhood with large, beautiful houses and lots of open land surrounds the little circle of townhomes that is right at the base of the majestic mountain range. To wake up every morning, look out the kitchen window and watch the sunrise colors change over the mountains was an absolute perfect way to start every day. Right out the front door is a large open space with a small swing set for the kids - again with the mountain view surrounding. The home is very beautifully decorated, comfortable, clean, cozy, secure and matches the detailed description on this site. The kids especially loved the (short) ladder (securely attached to the wall) up to the loft; they felt that was their secret space. There is no hotel that could compare to the feeling of being at home away from home nor could it afford the experience of a new area as if you live there as opposed to being a tourist. We watched the deer come to the back deck every morning to nibble at the exposed grasses. Engulfed in the mountains, wildlife, wide open fields we drove 10 min. into Jackson or a little farther to the Teton Village for snow fun, food and shopping. We took a friendly neighbor's advice and drove straight out of the subdivision, crossed Cache rd. and followed the winding scenic view to see moose, elk and bison roaming freely crossing right in front of us. The wildlife sitings, snowmobile tour, dog sledding, tubing, skating, skiing all with a warm place of comfort to come home to each day made our vacation not only memorable but truly magical. To the owner: Thank you so much for creating the foundation of what will reside in our family's heart as our best family vacation ever and fabulous memories of our children's first adventure in snow. Urgencies: If you are experiencing an urgent issue, please call our office number first at (307) 734-2404. If your emergency is lodging-related and it can't wait until business hours, please call our after hours number at (307) 690-3806. For medical and other emergencies, call 911.